"What is Chinmaya Jnana Yagna?" Jnana Yajnas are series of public discourses on a Vedantic scripture given by an Acharya of the Chinmaya Mission. The term yajna means to offer oblations to fire and Jnana means knowledge. Offering of our ignorance to the fire and kindling the light of knowledge is what is the import of this term. CMA conducts 2-3 jnana yagnas of visiting Acharyas every year. CORD (Chinmaya Organization for Rural development) facilitates social service projects for the underprivileged. CORD USA is a registered non-profit in the US providing a sustainable program to aid in the holistic welfare of the underprivileged in the US, India & Sri Lanka regardless of race, religion, color, gender or nationality. Programs in India are facilitated through CORD India & in Sri Lanka through CORD Sri Lanka. CORD has been serving humanity in an holistic & sustainable way since 1985. Has the lowest overhead ratio (~0%) compared to any other organization. CORD has built a sustainable and replicable model by focusing on development (teaching people to earn a living) as opposed to welfare (e.g. donating food). The key success factor of CORD is their motto of Active Participation. The villager has to be willing to take the first step to transform his/her life and CORD will take 5 steps forward to assist the person. Facilitates integrated, sustainable social help programs in local communities and in the Indian subcontinent through processes of self-empowerment and enrichment. CORD has uplifted & transformed over 1000 villages in India & Sri Lanka. CORD USA has been awarded the top rated charity award by Great Non Profits every year since 2012. Chinmaya Tej is CMA's walkathon for CORD that is conducted yearly. CORD is a bond of love & understanding; a sharing which enriches both the giver and the receiver. Krishna mela is the annual day event at CMA. It is aimed at exploring topics and themes that enhance the Bala vihar curriculum and increase the bonding of the kids and families within CMA. The concept of 'Krishna Mela', named after the "Sundar Krishna" deity at our ashram, was started in CMA in 2015 as part of the centenary celebrations for Pujya Gurudev (Swami Chinmayanandaji). A full day event with booths, performances and delicious home cooked food for the whole family to enjoy; with all volunteers working in the "Unto Him Our Best" spirit. Given the space in the ashram hall, the attention span of the audience and the number of Bala vihar kids and classes, we have followed this model for stage performances. There are 5 shows, each 1-1.5hrs long, allocated to a time slot. Each show has performances by 6 grades. Performances are based on a specific theme and this year's theme is "Success"
Summer camps at CMA are a fun and enriching way to enjoy the summer. Kids 5-18 engage in various activities throughout the day from Yoga, music, art, shlokas, bhajans to discussions, interactive learning, indoor & outdoor activities. Sumptuous vegetarian meals are offered. Every camp has a specific theme around which all the activities are planned. 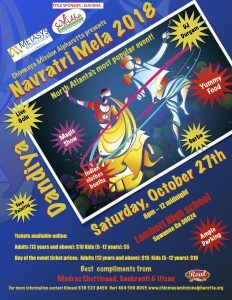 Upcoming Fundraiser: Navratri Mela on Oct 27, 2018 from 6:00pm-12:00am at Lambert High School. Click here to buy your tickets online. Please provide your email and password to login.